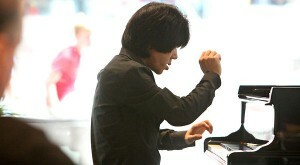 Taka Kigawa performing in the lobby at 1 Liberty Plaza on Monday in this daily series sponsored by Arts Brookfield. What’s wrong with this picture? New York City’s major institutions have done little to commemorate the 150th anniversary of Debussy’s birth, but Arts Brookfield — the performance presentation arm of Brookfield Office Properties, a real estate concern that operates large office buildings in New York and across North America — is filling the gap with Debussy 150, a free four-concert series in the lobby of 1 Liberty Plaza in Lower Manhattan. The daily concerts, devoted mostly to this composer’s revolutionary piano music, are meant to honor the anniversary by running 150 minutes, from 11:30 a.m. to 2 p.m., through Thursday. Perhaps Arts Brookfield’s involvement should not be so surprising. The company began sponsoring concerts about a decade ago, and in recent seasons its offerings, especially in the Winter Garden at the World Financial Center, have been both plentiful and adventurous. Its summer season began, after all, with the Bang on a Can Marathon and included several River to River Festival concerts. That said, Debussy 150 is an odd little festival. One Liberty Plaza is not quite the Winter Garden, and though the Debussy concerts take place in a corner of the lobby, far from the building’s elevator banks, you hear the security stations beep every time someone enters or leaves, which is roughly every couple of seconds. Given that, 11:30 a.m. might not be the ideal time for concerts in an office lobby. Apart from the beeping and occasional squawks from the security guards’ radios, there was the constant chatter of people coming and going, oblivious to the concert, but perhaps curious once they realized that something was going on: the crowd of listeners grew steadily. Each program includes sets by two pianists (with chamber music in the finale on Thursday). At the first installment, on Monday, Taka Kigawa opened the program with thoughtful, poetic accounts of Debussy’s 12 Preludes, Book II, and a rich-hued rendering of “L’Isle joyeuse.” Mr. Kigawa’s Debussy is carefully shaded and texturally transparent. He knows how to make this music sparkle, as in the final Prelude, “Feux d’artifice,” with its fiery washes of sound. He is equally adept at tapping Debussy’s sense of mystery, as in the shimmering opening of “L’Isle joyeuse,” or in the almost mystical chromaticism of the Prelude No. 10, “Canope.”As an extended encore, he repeated about half the Preludes.